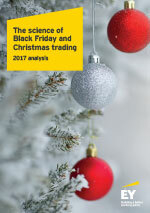 Our annual The science of Black Friday and Christmas trading report analyses data on the discounting behaviour of the UK’s leading 50 retailers (excluding grocery) during peak season trading, and collates information on discounts offered on brands’ online homepages over a six-week period from mid-November to early January. 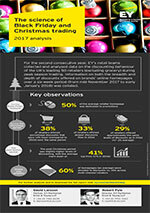 Download our infographic for key observations from the 2017 peak trading period. Download the report for more detailed analysis of the 2017 peak trading period.